It was just another routine rest stop on a Bolivian bus ride. My wife stayed on board while I went to find a toilet. The inside of my local Bolivian bus – minutes before this story took place. Um… what do I do now?! As my panic began to grow, I spun around looking for any sign of our four-wheeled transport. That’s when I heard a familiar voice calling my name from afar. Moments later, I located Carrie sitting on the edge of a shoddy wooden barge a few dozen feet from shore. Next to her was our bus. This video is of my reaction as soon as I realized what was going on! …but I left my Superman cape at home. …it didn’t appear to be more than waist-deep. You can see Carrie sitting on the far right side of the boat, enjoying a snack. Accept the situation and know that it will eventually make one helluva story. Fortunately, that line of thinking calmed me down and I chose option #2. Luckily, the shores of Tiquina, Bolivia, are lined with boats of all shapes, sizes and colors. By this point, Carrie was well on her way to the other side of Lake Titicaca. “Excuse me. My wife and my bus are floating away on that boat. A few non-committal shoulder shrugs later, a friendly woman pointed me towards a small motorboat that was quickly filling up with passengers. The captain told me to give him two Bolvianos (about 28 cents) and have a seat. Empty when I first boarded, this boat soon filled up with all the other passengers on my bus. For 2 Bolivianos, the San Miguel ferried us across Lake Titicaca. At this point, several of my fellow bus riders were on board and acting far more nervous than I. “Hurry up; let’s go! The bus is going to leave,” they shouted at the captain. 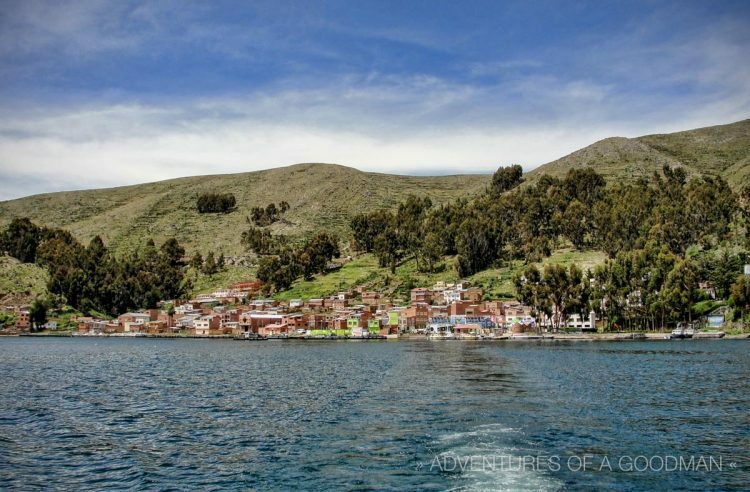 Finally, with the motorboat full of passengers from our bus, we set off on a three-minute ride across Lake Titicaca. The trip was so fast that we landed on the other side before the bus. The view of Tiquina and Lake Titicaca from the back of the San Miguel. Our green bus driving down the street was a site for sore eyes! Another few minutes would pass before I saw Carrie walking down the street. Our bus was not far behind; although, we had a few more minutes before it finally left. A few days later, we learned my separate motorboat voyage was, indeed, a normal part of the bus ride between Copcacbana and La Paz. However, the driver usually tells the passengers what’s about to happen. …and one American watching his wife float away.